If your family eats grapefruit (or any other citrus with seeds), you can plant the seeds and grow bonsai citrus trees! Now citrus trees don’t make great bonsai (the leaves are a little on the large size), they do make reasonable bonsai. And they grow pretty fast. John, Molly and Annie E. have a citrus that they worked on at our repotting workshop two years ago – a very nice tree. A major ‘thank you’ to our outgoing officers: Mike P., treasurer; Tim O., vice-president; Greg G., librarian. Their time and work on behalf of the Badger Bonsai Society is greatly appreciated! We could not operate without members willing to volunteer and serve. Thank you! This is on the corner of University Avenue and Allen boulevard – same location as in past years. Cocktails at 6 pm and dinner at 7 pm. There will be separate checks and you will be able to order from the menu. Dues are also due with the start of the New Year. Hope to see you on Thursday. Karl B will speak on “What Makes a Good Bonsai?” What do judges look for when selecting trees for prestigious bonsai shows? It is difficult to improve our own trees if we don’t have a clear vision of the perfection for which we are striving. 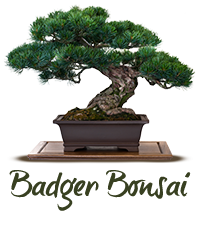 With images of the best bonsai, we’ll discuss what the hallmarks of a really great bonsai are, and how to achieve them. December is also our cookie-fest. Get an early start on your holiday calorie consumption. If you have a favorite recipe and time and inclination, bring some to share with the rest of the group. Not required of anyone, so please come whether you bring cookies or not. Officers were to be elected in November (which we didn’t do) so we’ll hold elections for anyone wanting to hold office in the Society. If you missed the November meeting, you missed a great talk by Brian B discussing his collecting and experiences using hackberry – Celtic occidentalis. It is a common tree in the central US and its range extends north to about Wausau. It is common on flood plains, but is tolerant of a wide range of environments. Brian reports that the leaf size reduces dramatically when bonsai-ed. In addition, a gnarly, warty bark develops in a handful of years. This warty bark helps to identify the tree even when the tree has no foliage. Trees growing in wetter sites can often be collected with a minimal amount of digging. When I mentioned to Barbara B what a wonderful presentation it was, she said, “Well, do you know where the Wisconsin State Record hackberry is located?” For someone who has trouble remembering the location of his car keys, I gave a succinct and unambiguous, “no – where?” It is located right here in Madison at 1815 Summit Avenue. It has a circumference of 164 inches and a height of 98 feet. She knew of it because the beautiful yard was on the Olbrich Garden tour this year. The tree was just a bonus. Speaking of champion trees, local arborist Bruce Allison is the author of Wisconsin’s Champion Trees published in 2005. It is available from the public library, or from Amazon – about $14. While we bonsai hobbyists aren’t interested in big, old trees per se, we want our bonsai trees to look like big, old trees. The Tree of Ténéré, was a solitary acacia that was once considered the most isolated tree on Earth— the closest neighboring tree was 250 miles away. It was in the Tenere section of the Sahara desert in northeastern Niger. It’s roots reached the water table 131 feet below the surface. It was knocked down and destroyed by a drunk truck driver in 1973. Our next meeting, Thursday October 9, will be a lecture and workshop on suiseki. I have about 18 suitable stones that I will bring for club members. These all have cut bottoms, which will make the daiza carving much easier. The largest of these stones measures about 5.5 inches, and the smallest about half this size. What I would like you to bring is a piece of scrap lumber (walnut, maple, mahagony, would be good; oak not so good; pine okay if that is all you have) that measures no smaller than 5×5 inches, 3/4 inch thick, for the base of the stone. The attached email from Stone Lantern has some good deals. I am placing an order for myself. If anyone else wants any of these items, let me know via email ASAP, and I’ll combine them on one order.